Kevin Smith is a student of the game. "It really started when I got to college, and I knew I wanted to be a professional," Smith said. "So, like anyone in a profession, you want to know the most about what you're about to experience and what you're doing, and that will help you throughout your career." Thus, Smith went to work consuming books, video and theories on hitting. He analyzed approaches. He sifted through the lessons of others in the game. "I really like to invest my time in studying guys and studying theories of hitting, and what different guys are teaching, and then kind of take in the bits and pieces here and there and translate it into my own swing," Smith said. "It's almost just trying to weed through all the information that's out there, and just trying to find something that works for you." Now ranked as the No. 18 prospect in the Toronto Blue Jays system, Smith understands the need for players to have access to the best information available. With this in mind, he created a brand -- Elevate Baseball -- which aims to make drills and tips available to players through social media. The account, which launched on Twitter in 2014 and was reinvented last offseason, currently focuses on defensive work. "There's a lot of hitting stuff and pitching stuff on social media, but you really don't have a whole lot of defensive stuff," Smith said. "A lot of guys back home, younger guys I've talked to, want to know more about what kind of defensive drills they can do, what to do to get ready for games defensively. I felt like it'd be a good outlet to get information out there and get some talk going over social media. It should be fun to see what it develops into." Smith is often lauded for his own defensive prowess. In 106 career games as a shortstop, Smith has a .957 fielding percentage, and this season he's branched out and spent time at second and third base. A fourth-round pick out of the University of Maryland in 2017, Smith has also gotten it done with the bat. 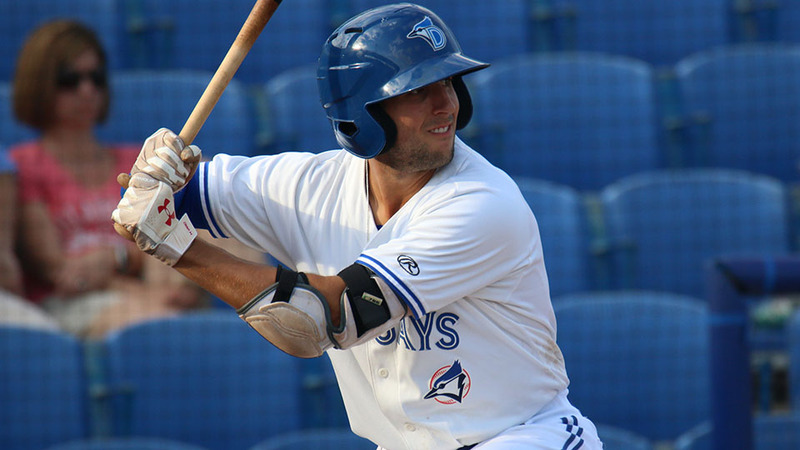 He tore up the Midwest League in the first half, batting .355 with seven homers in 46 games before earning a promotion to the Dunedin Blue Jays on May 28. He's contunued his breakout campaign in the FSL, hitting .311 with six homers over 28 games for Dunedin and picking up Player of the Week honors yesterday for his efforts. While Smith spends his offseason pouring over data, he stays away from too much analysis during the summer. "I've talked to my hitting coach, and I think I got over-analytical a little bit, where I'd study everything and try to be perfect instead of just trying to go up there and compete with the swing I have," Smith said. "I'm trusting the stuff that I worked on in the offseason, and I like where my swing is at, so just trying to stay as consistent with it as I can and keep my routines the same." With Elevate, Smith hopes to expand the account in the future to encompass all aspects of the game -- hitting, pitching, and defense. "Kind of make it a one-stop shop, so guys aren't searching for information or doing stuff wrong out of season that they think is helping, when it's really not," Smith said. He believes in the importance of the process, and hopes that young players who happen upon the account will gain an understanding of the countless hours of preparation behind every successful athlete. "You've got to really love it, and you've got to put the time in," Smith said. "I see a lot of young kids that just think if they do one drill or two drills, they're going to become the next Mike Trout or Bryce Harper, and it really doest work that way. So, we're trying to shed as much light on the failures and all the hours in the gym and all the swings that guys take -- it doesn't just show up at game time, you have to put the work in." Strong armed: After posting a league-best 3.20 ERA in the month of June, the Lakeland Flying Tigers are off to an 8-1 start in the second half. In those nine games, Lakeland has surrendered only 18 runs. Alfred Gutierrez limited opponents to a .170 average and posted a 2.10 ERA in six starts in the month of June, while Spenser Watkins put up a 2.08 ERA in four starts. Arraez on the rise: Twins No. 21 prospect Luis Arraez has caught fire, raising his average from .202 on June 1 to .320 at the start of July. In 26 games in the month of June, the 21-year-old hit .449 with nine doubles, three triples and a home run, while driving in 13 runs. Arraez matched a career high with five hits on June 22, and finished the month of June with 16 multi-hit games. All is Wells: Fort Myers Miracle starter Tyler Wells permitted only five runs across four starts in the month of June for a 1.63 ERA, while limiting opponents to a .168 average. At the start of July, Wells ranked second in the FSL in ERA (2.54), first in WHIP (0.93) and first in opponent average (.194). Kirsten Karbach is a contributor to MiLB.com. This story was not subject to the approval of the National Association of Professional Baseball Leagues or its clubs.